Prepaid phone plans, often referred to as a pay-as-you-go plans, can be one of the best ways to save money while enjoying the many advantages of owning a cellphone. In just a handful of years, the advance of the cellphone has taken the world by storm, and people from all across the globe and from all walks of life and all income levels spend hours with their faces gazing down upon the lighted screen of a smart phone. With a pay as you go plan you only pay for the minutes you use, and you’re not tied in to a lengthy service contract. This can work out very well for the consumer, but make no mistake, your cellular carrier will certainly try to tempt you with a contract that not only gives you a ‘free’ phone, but also hundreds of voice minutes, gigabytes of free data and thousands of free text messages, all to ensure that every month you are paying them a sum of money for the privilege. 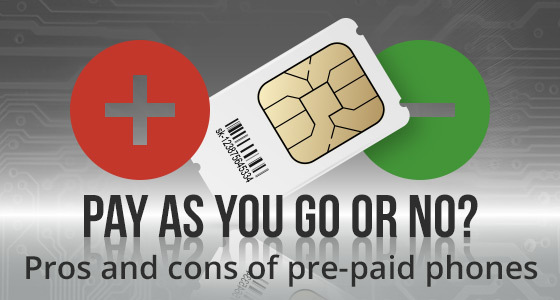 On the other hand, for those who prefer to pay only for what they use, a pre-paid service is simply a matter of choosing a phone and then paying a certain amount through regular top-ups based purely on consumption. The question is, what makes more sense for you; a regular contract with a monthly allowance of calls, data and messaging, or just a pay as you go plan? One of the greatest benefits in using a pay-as-you-go cellphone is the amount of money you can save on contract fees and purchased minutes. All you need is to top-up the phone as and when you run low on credit. If you tend to use free communication apps such as Facebook, Twitter, Whatsapp or Skype, this kind of plan can make a lot of sense, as you are not even using any call credit, and yet you are still communicating. Pre-paid users only buy minutes they think they will use with the option to buy more as they need it. Top-ups can be as little as $5.00 (US). On the other hand, with a set monthly contract you might, for example, have 500 voice minutes assigned to you each month. If you only consume 200 minutes, you are paying for 300 minutes per month that you do not use. Paying for minutes as you need them makes it easy to control your phone usage and assures that there are no eye-watering surcharges, should you exceed your allotted call minutes. Pay as you go also means you are not tied to any contract. You are free to try various service providers to arrive at the best solution for your needs. You have no monthly bills, no contracts to sign, and no early termination fees. Also, and just as importantly, there are no credit checks for pay as you go, so there is no fear of rejection by any cellphone carrier should you be a low income earner. Pre-paid plans can also work extremely well for children and teens, as it means you are in control of how much they consume. This way you won’t have to worry that they are logging on to costly online video games, which produce nasty surprise bills that can often run to hundreds of dollars. If you visit the large, high-end cellphone carriers you will quickly discover that most of the cellphones available for pre-paid plans tend to be entry level models, and the store assistant has been trained to be dismissive of such plans, trying instead to tempt you into a big fat 24 month contract. The pre-paid phones they offer lack features, processing power, and the quality that you might want. If you want a cellular device designed with a high pixel rate camera, a great music player, high processing power and access to a wide variety of apps, a traditional pre-paid cellphone may not satisfy your needs. However, as reliable online cellphone unlock services such as UnlockBase are proving every day, what once was a distinct disadvantage for pre-paid plans – a very limited choice in pre-paid handsets – is rapidly becoming a thing of the past. UnlockBase has a huge database of cellphones of all types and hundreds of cellphone carriers from all over the world. With a simple code they can help the customer to simply ‘jail-break’ the cellphone model of their choice. The other disadvantage with a pre-paid plan is that you need to keep a regular check of your available credit, because you will literally be cut off in mid-sentence once your credit runs out. Imagine if your car happens to breakdown in a cold and lonely spot miles from anywhere or anyone, this can quickly become a real and dangerous problem. It’s also highly inconvenient even if you are simply trying to have a conversation. One way to overcome this problem is to always carry an extra top-up card with you in case of emergencies. Pay as you go or no? So should I opt for pre-paid? Pre-paid plans are ideal for those who do not consume excessive amounts on phone calls and for controlling the spending habits of children and teenagers. These plans also work well for those with few cellular needs. New SIM deals such as Vectone, Lycamobile and Lebara also offer pay as you go with the benefit of significant savings on overseas texts and calls – and free calls if made from one Lycamobile number to another in certain countries. Decide what you need most with your cellular plan and see if a pay-as-you-go deal works best for you! Cellphone jailbreaking legislation: know your rights Would you dare to jailbreak your Apple iOS 9 device?